The boom and bust have played out in the charts posted here (with appropriate dire warnings) over time. 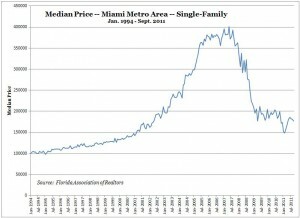 Here’s another view, this time based on the monthly median single-family home price for the Miami metro area, tracked by the Florida Association of Realtors. It looks like prices are roughly back where they belong. Basically, the show is over. And it’s tempting not to try to put too fine a point on it. But don’t let the boom and bust cloud your judgment. Before the boom, the notion of a decline in home prices was consigned to insignificant seasonal wiggles within a gradual upward trend. The idea of even a 10% decline in prices would have shaken people to the core. Now that we have lived through a >50% decline, there is a temptation to glibly brush off another 10% or so. Yet if you’re only putting 10% down, a 10% decline wipes out your equity. So we really do still need to care about the risk-reward balance. That’s a beautiful chart for anyone who sat out the boom and wants to buy for the long haul. 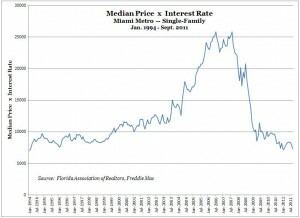 True, the risk of ruin from rising rates is much lower when buying near historically normal prices. For one thing, rates are not supposed to rise unless the economy does better, and wage gains could then offset rising rates (as in the 1970s, when inflation ran hot but wage gains did too, and home prices actually rose smartly even as the 30-year mortgage rose from 8% to 16%). But extraordinary measures have been taken. A vast sum of money has been printed. The Federal Reserve has reportedly surpassed China to become the single largest owner of U.S. Treasury debt. If (or as some would say, when) inflation runs hot, rates could go up even as wages remain under pressure from economic weakness, foreign competition, etc. Higher rates without higher wages could put new downward pressure on prices. 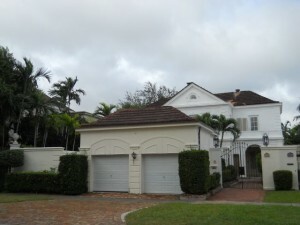 If you’re thinking of buying real estate in Miami (South Beach, Brickell, Coral Gables, Coconut Grove, Pinecrest, etc. 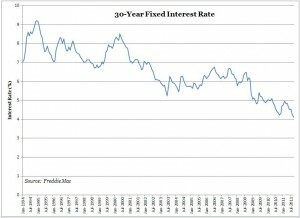 ), the low rates make it temptingly affordable. Just know the risk when you reach for that reward. 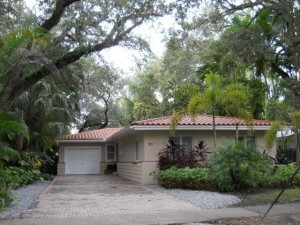 Perhaps the strongest pricing in Coral Gables is in the vicinity of the highly regarded Sunset Elementary School. As REF has explained here and to customers, buying a house in the Sunset neighborhood does not mean you get to go to the school. Really, the alarm cannot be sounded too often on this point. With that in mind, what are people getting for their money in the Sunset Elementary area of south Gables? Two recent sales show just how divergent the current real estate market can be. For $849,000, a Bahamian corporation took 743 Tibidabo Avenue off the hands of the people who bought it for $820,000 in January 2008. Who knew the market went up since then? The price of $849k works out to $430/sf for this 1,972-sf pillbox. The house was already updated in 2008 (I know — I was in it), so that’s not the explanation. On a brighter note for buyers in the Sunset Elementary neighborhood of Coral Gables, the classic French Village home at 1013 Hardee Road sold for $880,000, or $256/sf for the 3,431-sf beauty. Yes, it needs updating and maybe some repairs. But you could put $100,000 into it and still be at just $285/sf. Heck, you’d have to put $600,000 into it before you’d hit the $430/sf that the other people paid for 743 Tibidabo. Plain ranch-style homes are a fact of life in South Florida. And maybe I’m a bit of an aesthetic or architectural snob. But there’s something to be learned here. It’s actually a guiding principle here at REF. The real estate market is inefficient, and there is value to be had . . . or not.